In the wake of a lawsuit filed by Democrats over the purging of names from Virginia voter registries, a Loudoun County registrar has been ordered to purge names from her county's list by the end of the week. Virginia Democrats filed a federal lawsuit Tuesday against Republican Gov. Bob McDonnell and Attorney General Ken Cuccinelli, accusing them of purging -- possibly in error -- thousands of voters from registration lists. The Democratic Party of Virginia is accusing election officials, including Cuccinelli, of pressing forward with a plan to potentially purge up to 57,000 registered voters because an interstate database shows them registered in multiple states. The voter list was sent out from the State Board of Elections in late August, developed using a data exchange with some other states. The 57,000 names are those of voters who are registered in more than one state. Fairfax County immediately started to purge based on the list, and of the 7,934 names they were given, 7,106 were purged. Loudoun County registrar Judy Brown decided this was a sensitive undertaking and decided to wait until after Election Day. But when the story broke Wednesday and her electoral board learned she was not doing the purge yet, they met and ordered her to start immediately. Now Brown must purge names of voters that she's confident are living in other states, based on the data. She's been ordered to complete the task by the end of the week, and then conduct a more extensive review of the other names by Election Day. The Democratic Party of Virginia is claiming that tens of thousands of voters are at risk of being wrongly purged from voter rolls ahead of the state's gubernatorial election. They say the list is filled with errors, and thousands could be wrongly disenfranchised. The lawsuit claims that the interstate database has been created by Republicans who purport to be preventing fraud, but in reality are seeking to suppress vote totals in communities that traditionally vote Democratic. Cuccinelli is running against Democrat Terry McAuliffe for governor in a race that is drawing national attention. The lawsuit says state officials have told county registrars to use their "best judgment" in whether to purge voters. That approach, according to the lawsuit, will lead to voters being treated differently in different jurisdictions, violating constitutional guarantees of equal protection. The suit seeks an injunction barring the voter purges. According to the lawsuit, some counties, including Loudoun and Chesterfield, had decided against purging voters. Others, like Fairfax and Prince William, are in the midst of purging names. Brian Gottstein, director of communication for Cuccinelli, said Wednesday afternoon that the board is conducting ordinary voter registration list maintenance mandated by state law. Gottstein said the 57,000 people who were identified by data matches appear to have registered to vote in other states after registering in Virginia. "By law, if they have registered in other states, they are required to be removed from Virginia's voter registration list," Gottsein said. "After carefully analyzing the data, the state board notified local registrars to carefully review each registrant and perform legally mandated list maintenance. The purpose of these commonsense laws is to prevent people from committing voter fraud by registering and voting in multiple states." In Virginia, state and local election boards are controlled by Republican nominees when the sitting governor is a Republican, as is the case with McDonnell. "At best, Defendants' conduct reflects inadvertent sloppiness in attempting to ensure that unqualified voters do not vote in Virginia's election. At worst, the conduct is driven by partisan politics. Neither explanation justifies the conduct," the lawsuit states. Chris LaCivita, a chief adviser to the Cuccinelli campaign, called the lawsuit a "politically motivated stunt." "Under Virginia law no one is denied the right to vote," he said. "Apparently Democrats have a problem with local registrars doing their jobs." Josh Schwerin, a spokesman for McAuliffe's campaign, said the lawsuit highlights the potential conflicts that arise given that Cuccinelli has chosen to stay on as attorney general while running for governor. 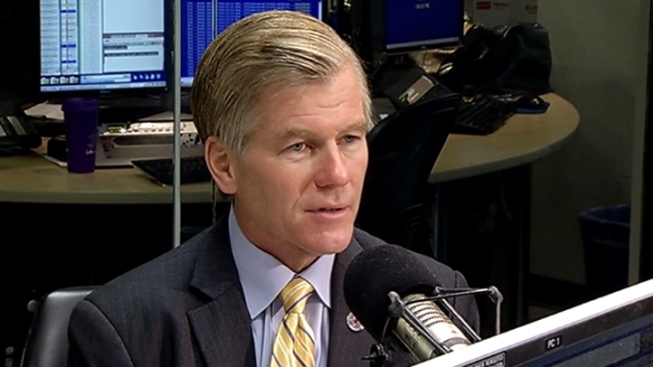 Most other attorneys general who ran for governor, including McDonnell, resigned to campaign full time. "Cuccinelli needs to answer questions about why it is appropriate for him to be a legal adviser in an election where he is the candidate," Schwerin said. "Ken Cuccinelli's refusal to resign his office as he runs for governor continues to damage Virginians' confidence that this upcoming election will be conducted fairly and impartially," said Democratic Party of Virginia Chair Charniele Herring. Gottstein denied that Cuccinelli is directly involved, calling it "an outright lie." "While a career assistant AG does provide routine legal advice to the state board, the Democratic Party's baseless assertion that the attorney general 'is enforcing the SBE's unlawful purging of voters' is patently false," Gottstein said.